E-Trade is going into the third year of Super Bowl Babies commercials with a social media application spreading the humorous campaign with ETrade BabyMail. The ETrade Baby, spokesperson, child prodigy and financial wizard, appears with his peers in commercials, and their out takes, online at www.etrade.com/baby and the E-Trade YouTube channel. Social media interaction is encouraged at the EBaby Twitter stream and Facebook, along with a newly launched application online at etradebabymail.com. See the 2008 and 2009 campaigns here. In Girlfriend the E*Trade tries to explain why he didn’t call last night. Baby’s credibility takes a hit, however, when his girlfriend grills him on whether the “milkaholic” Lindsay was over, and the troublemaking tot, upon hearing her name, dodges into the lens. First Class features a baby on his way back from a bachelor party. Baby takes to the skies, lounging in the plane’s cabin on his way back from a bachelor party, sipping a glass of milk and bantering with a friend, bragging that E*TRADE automatically triggered his stop-loss orders while he was living it up on vacation. Tears the E*TRADE Baby finds his peers crying after seeing pictures of their expensive broker on a yacht eating lobster. Lottery features Baby in a convenience store, mocking an adult who is fiercely focused on his scratch-off lottery ticket. “You know your chances of winning are the same as being mauled by a polar bear and a regular bear in the same day?” he asks, encouraging his friend to stake his retirement instead on E*TRADE’s extensive planning tools. In Barbershop the E*TRADE Baby and his buddies form a barbershop quartet to say good-bye to their big expensive brokers. The Out Takes video provides a few humorous lines that would never make it into a television commercial. 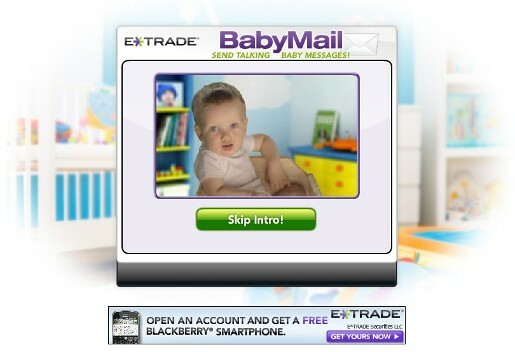 This year the campaign has been extended with an interactive social media app, Etrade Babymail. The app, designed by Oddcast, is designed to deliver video messages from one the E-Trade babies through email, Facebook, Twitter or your blog. Users visit BabyMail at www.etradebabymail.com and pick one of the E*TRADE babies or upload their own baby photo. Voice can be added by typing into a text-to-speech application, recording by mic, recording by phone or choosing one of the hilarious pre-set messages created specifically for BabyMail. Users can also upload their own photo to create the next talking baby sensation. Once created, the user-generated E*TRADE babies can be shared via email, social networks or on personal Web pages and blogs. The E*Trade Babies 2010 campaign was developed at Grey, New York, by creative directors Paul Behnen and Rob Baicocco, chief creative officer Tor Myhren, executive producer Bennett McCarroll, producer Kim Kietz and account executive Jon Holding. Editor was Alex Cohan at Grey’s Vision Post with producer Suzie Rosenthal and sound designer Dante Desole. Filming and post production was by director/creative director/lead Flame artist John J. Budion at Click 3X/Sparks with managing director Jason Mayo, Flame artists Mark Szumski, Sophia Avgousti, John Ciampa, Amanda Amalfi, CG artists Anthony Filipakis, Rob Dollase, Grace Hwang, Sung Kim, Tyrone Perry, head of production/producer: Jared Yeater, production coordinator Diana Chang, live action producer NY Rob Mackler. Shooting a series of spots that had to be assembled from disparate pieces to look like fluid live action presented special challenges. In Lottery and First Class, for example, the two characters are shot at different times, against a green screen, so Budion had to carefully plan the height at which to shoot each and consider how their eye lines would match up to one another as they conversed. Colorist was Gene Curley at Nice Shoes. Music was produced at Massive Music.